Sunday 12th September 2010 marks our fourth visit to the Merseyside Transport Trust’s annual Running Day. We have captured the excitement and atmosphere of the day, by taking you back in time with these superbly restored vehicles. Our programme starts at Liverpool South Parkway which as usual is the operating centre for the running day. We film the vehicles arriving to take up their duties as well as some of the visiting exhibits which include the beautifully restored Standerwick 60 (LRN 60J), a Bristol VRLL with ECW coach bodywork and a former Crosville Bristol VRT, DVG266 (HTU 155N) in the livery of Johnson Bros. of Hodthorpe. Moving to the city centre, at Exchange Street we get on board AEC Regent A267 (VKB 900) for a journey on route 77A to Speke Hall via Penny Lane and Liverpool South Parkway. Returning to LSP we join former Crosville dual purpose Bristol RELL, ERG52 (UFM 52F) for a ride to the Pier Head on service H1. 0238 (F238 YTJ) an Alexander bodied Leyland Olympian in the red and ivory livery of MTL North is our next ride to Liverpool South Parkway via Woolton on route 35A. 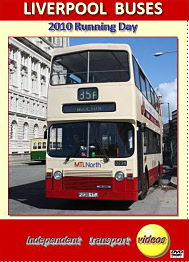 We join the bus at the Pier Head and travel through the city centre into the suburbs noting the contrasts of the route. Time is spent filming at LSP to review the comings and going of the vehicles as most of the MTT fleet and visitors pass by our cameras. It is now time to get on 1236 (BKC 236K), a Leyland Atlantean PDR1A/1R on service 80E to Penny Lane. This superbly restored bus is a credit to the team that have worked on it. There is plenty of action captured at Penny Lane as the buses come and go, recreating scenes from a bygone era. Our final two journeys are on a Volvo B6-50 with Plaxton Pointer body – 7227 (L227 TKA) smartly turned out in the red and ivory livery of Merseybus. We board the bus at Penny Lane for a run down to the Pier Head, passing by the former Lewis’s Ltd. department store soon to be converted to living accommodation - a beautiful building so much a part of the Liverpool scene. From the Pier Head we stay on 7227 for the ride back to LSP via Penny Lane and Woolton where we meet up with a couple of 7227’s former shed mates at both locations! independent transport videos would like to thank everyone involved in organising this brilliant event. Now enjoy the rides!